Ladakh, the land of high passes is famous for its immaculate mountain beauty and rich culture. With its picturesque landscapes, cold blue waters and mystifying passes, it is truly every explorer’s paradise. Ladakh showcases an exotic character and is shrouded in a transcendental aura. Enfolded by snow-capped mountains, it is a tourist destination that’s gaining huge popularity. Opting for our incredible Ladakh tour packages from Kolkata or Ladakh tour packages from Bangalore and Delhi can be the perfect opportunity to explore this wondrous land. One of the most beautiful treks in Ladakh, the Sham Valley can give you the traditional aroma of the villages here. Situated on the Srinagar-Leh highway, the Lamayuru Monastery is one of the most captivating places you can visit during your trip. 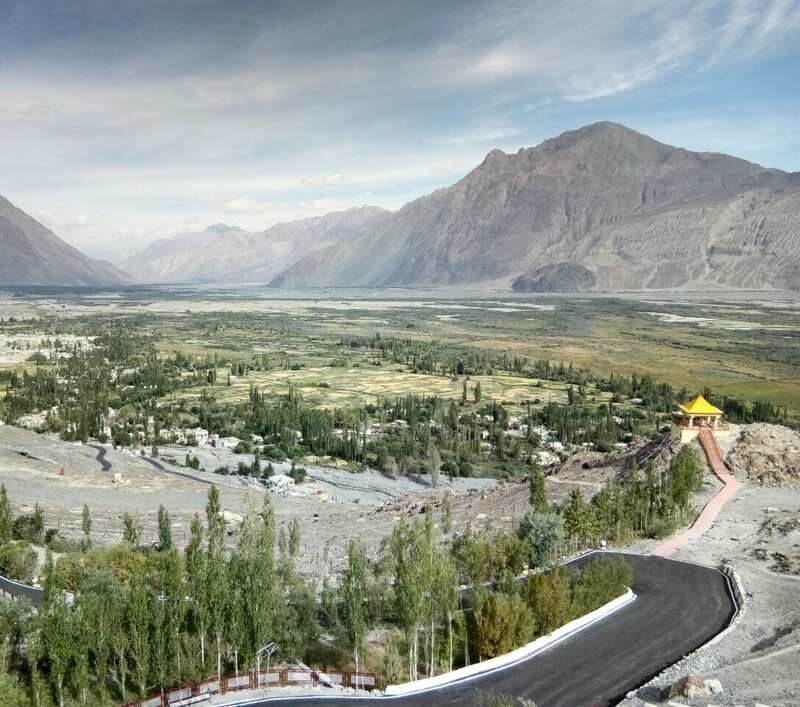 With breathtaking views, the Nubra Valley offers incredible scenery on a grand scale. It is renowned for the forest of Hippophae shrub. Day 1: Leh: Arrive at Kushok Bakula Airport in Leh. On a clear day the flight to Leh is quite sensational. From one side of the aircraft you can see the peaks of K2, Nanga Parbat, Gasherbrum at a distance and from the other side you can see Nun Kun massif. Transfer to a hotel in the city on arrival. Leh is at an high altitude and the body needs time to acclimatize. So, have some relaxing time in the hotel after arrival. Sip in some tea and have a nice lunch. Towards the evening visit Leh Palace, Shanti Stupa and Leh Market. Have a nice Ladakhi dinner. Overnight in Leh. Day 2: Leh – Sham Valley: Check Out from the hotel and start for Sham Valley – a drive of nearly four hours. Start the drive along the Leh – Kargil highway. On the way, stop at Gurudwara Patthar Sahib, nestled deep in the Himalayas. Drive some 4km further and you can reach Magnetic Hill where laws of gravity are defied. Drive further on the highway to reach the confluence of the Indus and Zanskar Rivers. Just before you reach Saspul, you take a detour to visit Likir Monastery, one of the most active monasteries in the region. A colossal image of Maitreya, installed out in the open here, is a real attraction. Resume the drive along the River Indus afterwards to reach Uletokpo. En-route you can choose to visit Ridzong Monastery. After all these visits drive a little further and check into a camp hotel. Have a nice dinner. Overnight in Sham Valley. Day 3: Sham Valley – Lamayuru – Leh: After breakfast head for the 11th Century Lamayuru Monastery. On the way you should not escape the mesmerizing moon landscapes, named do because these look similar to the land formations as seen on the moon. Lamayuru is located along the plain valley with mountains surrounding it on all sides. Have a look at the monastery. Start the return journey to Leh. First significant sight on the way back is that of Alchi Gompa complex. Dating back to 11th Century, this complex of temples is the most celebrated of Ladakh’s monasteries. Drive straight from Alchi to Leh. Check into a hotel on arrival. Have a nice dinner and retire to your room for a comfortable overnight sleep in the hotel. breakfast, head to Nubra Valley, situated at a distance of around 120km, but which takes around five hours to reach. The route to Nubra Valley passes over Khardung La, the highest motorable road in the world at 5,602m (18,390 ft) and around 39 km from Leh. From the pass, one can see all the way south over the Indus valley to seemingly endless peaks and ridges of the Zanskar range, and north to the giants of the Saser massif. Resume the journey afterwards and reach Nubra Valley, popularly known as Ldumra or the valley of flowers. Nubra Valley is situated in the north of Ladakh between the Karakoram and Ladakh ranges of the Himalayas. The average altitude of the valley is 10,000ft. above sea level. Check into a camp hotel in Nubra Valley. Walk around the small villages and interact with the locals. You can choose to visit a Ladakhi home. Have dinner at the camp hotel. Overnight in Nubra Valley. Day 5: Nubra Valley – Leh: After breakfast at the camp hotel, go to Hunder where you can ride a double humped Bactrian camel on the sand dunes of this high altitude desert with snow capped mountains on the horizon. It is amazing to see sand dunes at this altitude. Drive to Diskit, headquarter of Nubra Valley. Stroll around the bazaar observing the shops and local people going about their daily chores. Diskit is famous for 515 years old Buddhist Monastery, lying magnificently situated on a hilltop, facing the entire Valley. After a visit to monastery, drive back to Leh through Khardung La. Check into a hotel in Leh on arrival. You can relax in your room and enjoy a nice dinner. Overnight in Leh. Day 6: Leh – Pangong Lake: After having a nice breakfast in the morning, start for Pangong Lake, brackish water lake with a width of 5-6km and a length of around 130km. Two-third of this lake lies in China. On the way to Pangong, visit Shey Palace, the ancient capital of Ladakh. Driving further on the route with picturesque landscape, you come across Thiksey Monastery, an impressive complex rising tier upon tier on a hill above the village. After visiting these two monasteries drive further towards Changla Pass (5486m). This is a long easy ascent through winding roads. The route passes through Sakti Village. You can stop for some time at Changla Pass and then visit the village of Tangtse, where you can relax for a cup of tea. Pass through several more villages and all of sudden you get a view of Pangong lake situated at 14,000 feet (4,267 meters) behind the hills. Check into a camp hotel on arriving at Pangong lake. Have a nice dinner at the camp hotel. Overnight at Pangong Camp hotel. Day 7: Pangong – Leh: Morning at leisure to explore the beauty of lake and later we drive back to Leh en-route visiting Hemis Gompa, the largest monastic foundation of Drukpa Kagyu Order of Tibetan Buddhism. Drive further to Leh and check in at our hotel for Overnight stay. In the evening you can stroll around the market place for some last minute souvenir shopping. Overnight in Leh. Day 8: Leh- Onward Destination: Check out after breakfast to go to the airport to catch your flight for onward destination.